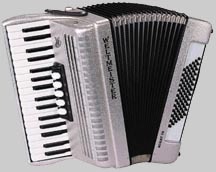 This is Weltmeister's smallest piano keyboard accordion. 26 regular sized keys and 48 basses. The Perle has 2 sets of clarinet reeds in the treble that are tremolo tuned and 3 sets of reeds in the bass. 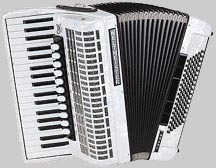 This instrument is a standard student model, but could also be used by the professional looking for a light weight stage accordion as it provides 7th and diminished chords. The physical size and weight of the Rubin is equal to the Perle 48 Bass. It offers an additional 4 keys going down to the low G, which allows for full chords to be played in the right hand. 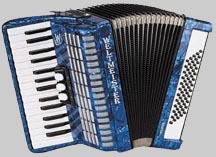 There are 60 basses that cover all the keys and a full range of tonality without the weight of a larger accordion. This installment is a beginners model, but it is advanced enough for a player to use it for 2-5 years. 34 keys and 72 basses with 5 registers and 3 sets of reeds on the treble side. This instrument is a complete new design which makes it light weight. It is ideal for an accomplished player who would like to down-size from a 96 or 120 bass. For its size this is a remarkably strong instrument. 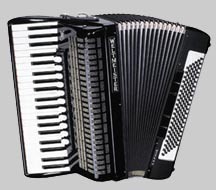 This is a classic 96 bass accordion in musette tuning, with full sized keys. 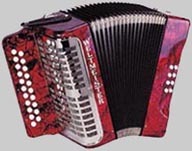 The Topas has 4 sets of reeds in treble and 4 in the bass. There are 11 registers for great selection of sound variety on the treble side and 5 registers in the bass. This instrument has Italian reeds. Also available in piccolo reed. 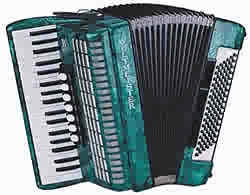 This is a classic 120 bass accordion with full sized keys and 4 sets of reeds in treble and bass. There are 11 registers for great selection of sound and variety on the treble side and 5 registers in the bass. 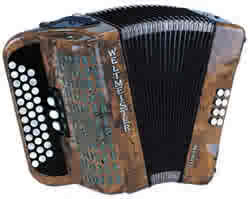 This instrument has Italian reeds and is available in musette tuning or the standard piccolo reed. 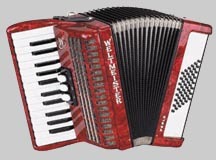 This two row button accordion has 21 treble buttons and 8 basses. There are 2 sets of reeds in the treble. The instrument comes with two straps and an adjustable bass strap. Special colors are readily available. Comes in GC, CF, AD, DG, BC and C#D tuning. This is a very popular model. There are 31 treble buttons with 2 sets of reeds and 12 basses. The instrument comes with two straps and an adjustable bass strap. Special colors are readily available with this particular model. Comes in GCF, FBbEb, ADG and BbEbAb tuning.